Procter & Gamble has launched a new Facebook campaign called ‘1 Like = 1 Day of Clean Drinking Water’ to let consumers engage and support its Children’s Safe Drinking Water (CSDW) Program. P&G has been sharing clean drinking water in developing countries around the world through its P&G Purifier of Water packets that contain a patented powdered technology for seven years. It is estimated that 22,000 lives have been saved to date through purification of 4 billion liters of water. CSDW program lets users take part in its global efforts. 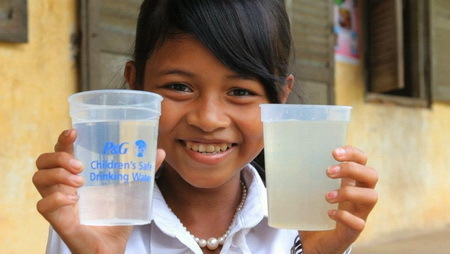 For each ‘Like’ on the P&G CSDW Facebook page, P&G will donate one day of clean drinking water through CSDW in a developing country. Facebook users will also experience the stories of those whose lives have been impacted by CSDW. Users can read stories, view photos, and watch videos related CSDW works with humanitarian, NGO, and emergency relief partners worldwide. The P&G CSDW Program also launched a new, interactive website at www.csdw.org, which provides users with news on the current P&G efforts worldwide. The company has previously announced it will rebrand the purification packets used by CSDW, which marked the first time in over 100 years that P&G gave its own name to a product. Earlier this month, P&G received the Award for Corporate Excellence from the State Department for the work done by CSDW and other P&G programs that help improve lives. Last year, P&G launched the GIVE Education program to increase awareness of the student dropout crisis in the USA.